How do I use multiple colormaps in a single figure? I have a figure in which I wish to use multiple colormaps. I would also like to know where the colormaps are stored and what are some of its properties. Examples will be useful. The first 32 rows of cmap are from the cool colormap, and the last 32 rows are from the gray colormap. idx contains integer values that range from 1 to the length of the colormap. The values are the actual row numbers of the colors used in the surface plot. The CData for an image object defines the rows in the colormap used to color the corresponding pixel (or bin). If the CData is logical, than a value of 0 corresponds to the first row, and a value of 1 to the second row. In this case to use multiple colormaps the CData should be converted to direct indexing; this is demonstrated in Example 2. CDataMapping: The CDataMapping property of Patch and Surface objects determines whether the objects scale their CData into the colormap (which is the default behavior) or whether the CData is a direct index into the colormap and should not be scaled. CLim: CLim is a property of Axes objects. It is a two-element vector that defines the color range. Usually, the CLim property contains the minimum and maximum values of the CData. You can use the caxis command to change the axes CLim property. By manipulating these three properties, you can force different objects to use different portions of the colormap. First, scale the CData properties of the individual objects so that they have nonoverlapping, contiguous values and the same range. If the CData values do overlap, then the plots will share some of the same colors. After scaling, set the CLim property so that it contains the minimum and maximum values of all the CData matrices. 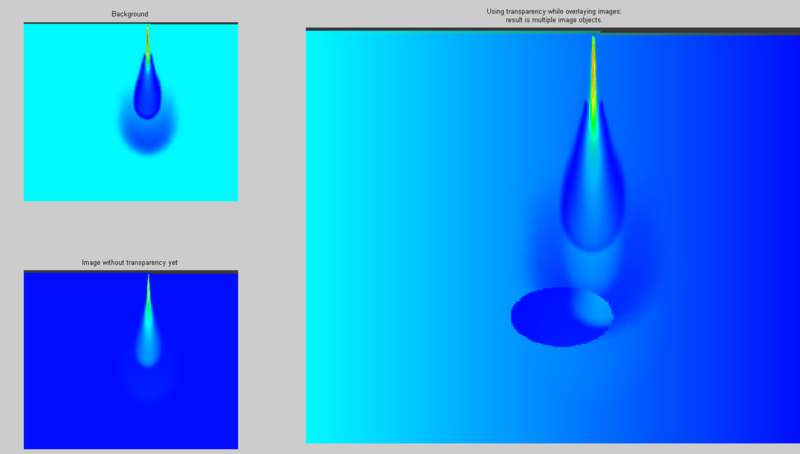 The following examples illustrate how to use multiple colormaps in single axes and multiple axes. % the gray colormap and assign it as the Figure's colormap. % Generate some surface data. % Produce the two surface plots. % Move the pcolor to Z = -10. % of the ZData does not change. % however, this is not necessary. % Initially, both CDatas are equal to Z. % Update the CDatas for each object. % CDatas of both objects. In this example, the CData properties of each object are mapped to integer values. The surface CData, C1, ranges from 1 to 64. 64 was chosen because it uses the first 64 rows of the colormap. Since the pcolor plot used the second half of the colormap, simply add 64 to C1 and the new CData matrix, C2, ranges from 65 to 128. As you can see, both C1 and C2 have the same range, 64. They are contiguous and do not overlap. If you are using MATLAB R2014b or later release, the function "colormap" accepts the handle to axes as input and allows you to set different colormaps for each axes. For example the following code snippet will plot two subplots with different colormaps. If you are using a MATLAB R2014a and earlier, the following example with show how you can get different colormaps for two separate axes. % Load some image data. % Define a colormap that consists of two separate colormaps. % Generate the first image. Note that we can set the CLim property of both axes simultaneously with SET; CAXIS will only affect one axis. % Create some polar data to work with. % Map the polar coordinates to Cartesian coordinates. % Generate a black wire mesh plot. % Project Data to the different planes. % CDX ranges from 1 to 32. % CDY ranges from 33 to 64. % CDZ ranges from 65 to 96. This example operates in much the same way Example 1 does. However, instead of partitioning the colormap into two pieces it partitions the colormap into three sections. If you have the Image Processing Toolbox, you can use SUBIMAGE in conjunction with subplot to create figures with multiple images, even if the images have different colormaps. SUBIMAGE works by converting images to truecolor for display purposes, thus avoiding colormap conflicts. This example shows how to overlay two axes in a figure and link them. One axes contains a contourm plot of a peaks function. The other axes contains a pcolor plot of the 2nd derivative of the peaks function. Since there is no CData property in contour plots, we can not manually assign it a portion of the colormap from the axes like Example 1 does. The contour plots automatically use the whole colormap of the axes. Instead, we can give the contour plot and pcolor plot each its own axes (with differing colormaps) and then overlay the two. The first axes is created, set with a gray colormap, and is filled with the pcolor plot. The second axes is then created, set to be invisible with a cool colormap, and then filled with the contourm plot. Each axes also gets its own colorbar on each side of the figure with correct values. Finally, the two axes are linked so that they always mimic each others bounds. Without this, panning and zooming would only affect the last created axes which is on top of the rest. Is it possible to use subimage within a GUI? It doesn't seem to accept a handle to the figure. Same problem with subplot. @Jason: Both subimage and subplot do NOT take figure handles as input, please consult their corresponding doc pages. Please open another thread and describe your problem as this is not really related to colormaps anymore. Is there a way to Overlay Multiple Axes with Differing Colormaps in a Single Figure (Example 5), for a 3-D plot, while maintaining different colormaps/transparencies? Linkaxes only applies to 2-D plots as far as I know. Gaurav Pathak commented "I have exactly the same problem still looking for the solution." You can contact MathWorks Technical Support for help on this issue.